Condo, 2 Bedrooms, 2 Baths, (Sleeps 2-8) Light & Bright upper!! If you are searching for a vacation that offers golf, tennis, first-class restaurants, exciting night life, and hours of relaxation in the beautiful desert sunshine, all while staying in a luxurious condo within a prestigious gated private country club setting... THEN YOUR SEARCH IS OVER!! Desert Falls Country Club offers golfers the spectacular beauty of the desert while challenging players to its 7017 yard, links-style, par 72 course. Featuring velvet greens and lush fairways, this 18 hole championship golf course designed by Ron Frehm is widely recognized as one of the deserts best layouts. You can also enjoy a magnificent clubhouse with restaurant, pro shop, tennis facility, racquetball, complete health and fitness center, lessons, driving range, and putting green. 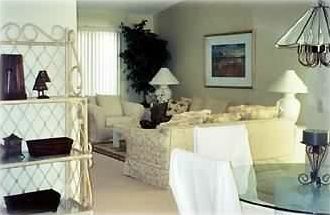 This second-story, beautifully furnished haven is steps from the 15th tee. Featuring soaring ceilings, a large living room with fireplace and wet bar leading to a formal dining room. A spacious fully-equipped kitchen features an additional eating area. The master suite has a king-size bed, a large private bath with two sinks, and access to the private balcony. BEAUTIFUL BRAND NEW TILE FLOORS throughout entire condo (except bedrooms) installed Jan 2016!! The charming second bedroom holds a full bed and two twin beds. There is also a full-size roll-away bed, 2 queen-size air beds, infant crib, etc. stored within the unit for your use. A laundry room with washer and dryer offers convenience. Three newer flat screen cable televisions - (updated since pictures) with HBO, DVD player, VCR with video library, CD/Stereo, cordless phone with answering machine, luxurious linens, and decorator furnishings are just some of the amenities for your enjoyment. Your private deck directly overlooking one of the 32 pools and spas also offers gorgeous views of the desert mountains. High speed internet with wireless capability and FREE long distance calling through the U.S. and Canada! Enjoy 'time on the town' with shopping on El Paseo Drive, that rivals Rodeo Drive in Beverly Hills. Five-star resort spa facilities, first-class restaurants, trendy areas such as the newly opened 'River' theater/dining complex and numerous casino's offer gambling and nightlife that rivals Las Vegas. Outdoor enthusiasts will find an abundance of activities to fill their sun drenched days!! Truly all the makings of a FABULOUS vacation!! Please be sure to view additional photos through the link below! We live about 3 hours away from this desert 'paradise'!! The location in the desert is perfect - right in the middle of everything!! My husband was a college tour player and LOVES this golf course. Tennis is so is relaxing at the pool located right below our back balcony - AHHHH!!! When we enter the gates at Desert Falls we know we are about to relax and make some happy family hope to share our 'home away from home' with you. No need to mess with firewood ~ enjoy the ambiance of a fire anytime with the faux logs! 2 spaces available in driveway and street parking available on a limited night schedule per association rules. Round wood dining table with 4 chairs 'secretly' can have top flip over to the felt poker table ~ fun game time!! We are fortunate to be just steps from a pool / spa! However, our community has 32 pools / spas and you may use any of them ... different shapes, sizes and views!